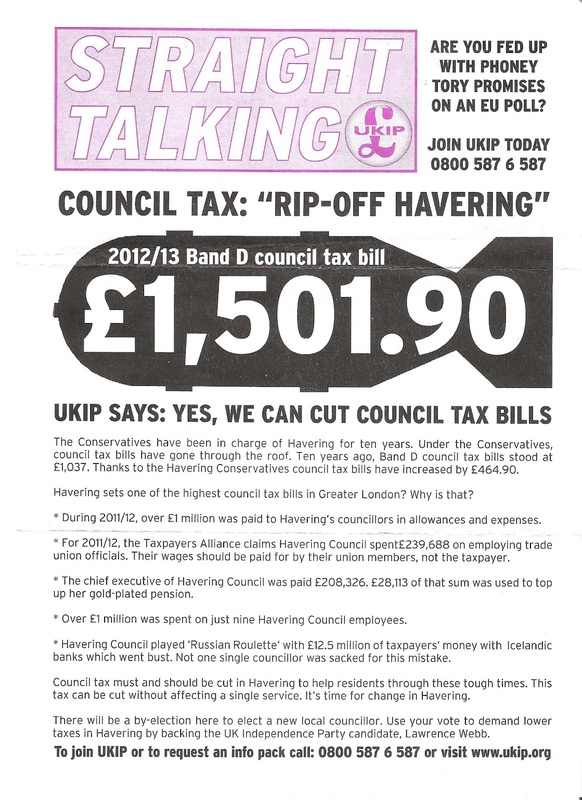 Will the UK Independence Party (UKIP) see its first councillor walk through the doors of Havering Town Hall tomorrow? You never know. Still, I’m predicting the ward will be a tremor in the wider UKIP aftershock, the impact of which has rocked the national political landscape in recent times. 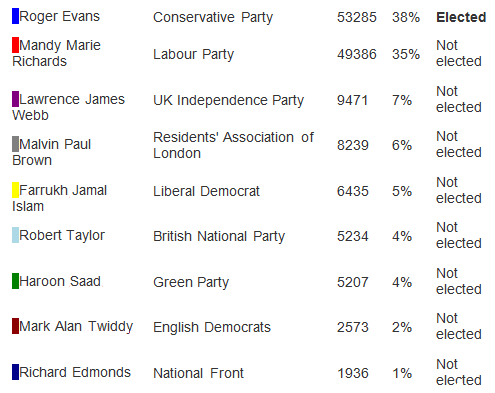 In the Eastleigh by-election last month, the party came second, beating the Conservatives and Labour. 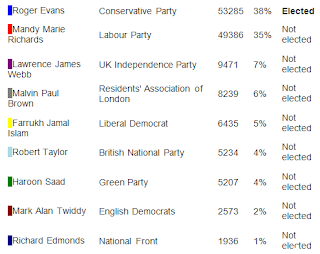 In 2011, it took control of its first council in Ramsey Town, Cambridgeshire winning 9 out of 17 seats. 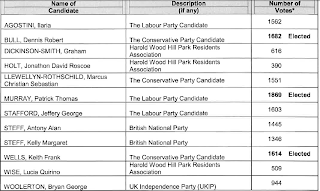 5 UKIP Lords have passed through the second chamber, and for 7 months in 2008, the party had one MP (who defected from the Conservatives and subsequently defected again to become an independent). Lawrence James Webb is the candidate for Gooshays. Last year he drew criticism from mental health charities for using the word “retard” on Twitter. 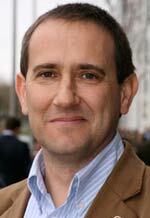 Lawrence won 3% of the vote in the 2008 by-election, with Bryan George Woolerton increasing that to 6% in 2010. Will the percentage increase again this time round? 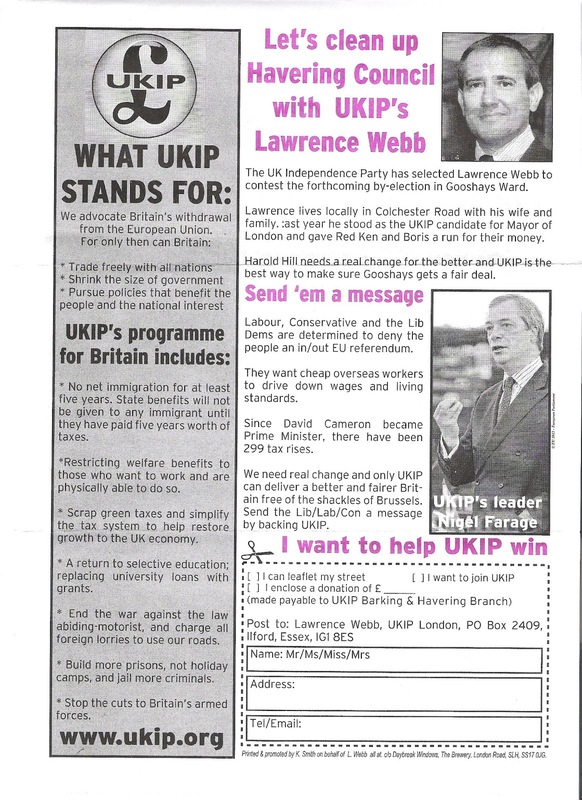 In the 2012 London Assembly elections for Havering and Redbridge constituency, Lawrence came 3rd with 7% of the vote beating the Liberal Democrats to 5th place. Nigel Farage, the party’s leader, is – by any definition of the word – charismatic. He has been characterised numerous times as someone you would enjoy having a pint down the pub with. UKIP’s policies and frankness about mass immigration and the EU speak to a section of the population who feel disconnected from the so-called metropolitan London-centric media chattering classes. Outside media-land and the Westminster bubble, many people feel the world is changing too fast and they’re being left behind. Our wages are either frozen, reduced or non existent. We watch the news in horror as the Eurozone continues to implode on itself (see what almost happened in Cyprus this week!). And on top of that, we face the prospect of wages being undercut and services being stretched as an unknown number of Romanian and Bulgarian immigrants become eligible to work in the UK. People perceive UKIP’s fiery rhetoric and simple solutions as the answer to all these problems. Earlier this month, I went to a Fabian society meeting in Romford to listen to ex-BBC journalist and political activist Polly Billington speak about her experience as a politician. Among them she said people who vote for UKIP “just want to world to stop so they can get off”. In other words, the rise of UKIP is inextricably linked to the ever-growing public disillusionment with politics and politicians generally. There is a lot at stake for Lawrence tomorrow evening. In theory, he should win a higher percentage than in 2010 due to all these issues currently being at the forefront of people’s minds. 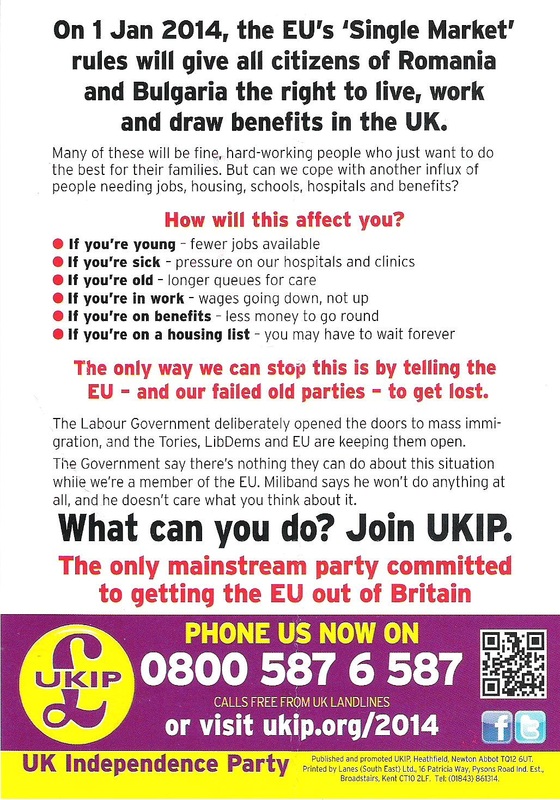 Having said that, I don’t believe voting for UKIP would solve any of these problems at a local level. 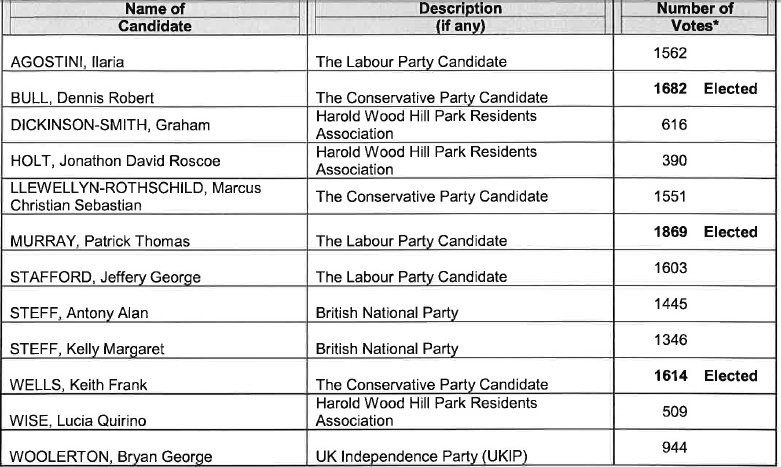 While Nigel Farage’s party may come across as radical and anti-establishment, a UKIP Havering councillor would not be part of the council’s main opposition Residents Association (the candidate being Darren Wise) who – as a group – can reign in the Conservatives. UKIP would also continue the tired old tradition of putting party central diktats over the wishes of ordinary residents.